Electromagnetic Fields occur throughout the universe. Here on earth magnetic fields are created by the movement of earth’s molten mass and surface crust. These magnetic fields were part of the essential environment for life to begin. 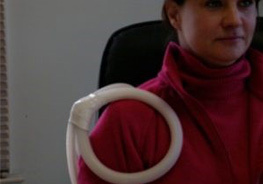 In our therapeutic equipment electromagnetic fields are created by passing electricity through a metal coil. The magnetic field is then conducted through an insulated tube to be applied where needed. Every cell of the body moves electrons much like a battery and this flow is necessary for every cell to function. When the flow is decreased; cell function slows down. If there is not enough flow; function stops. This vital flow of electrons is metabolically maintained in a part of the cell called the mitochondria. However, even this cellular powerhouse, much like any engine, needs a flow of electrons to take in molecular fuel and generate energy. Age, exertion, stress, overwork, trauma, toxins, exposure and infection can stall this powerhouse and that is when you see signs of discomfort, fatigue, dysfunction or disease.